Villa 'Chabrol' is a superb new villa with a lovely panoramic view on the Mediterranean Sea. It is totally independent and peaceful nestled in a green park of 3000 square meters. It is a showcase of antiques, comfortable furnishings, convenience and window screens in every room. The living-room is exquisite and huge with French doors leading onto the large furnished panoramic terrace. The terracotta floor with mosaic are works of art. Comfortable velour couches and armchairs feature the lounge perfect for relaxing. Green velour seats and ivory furniture offer a lovely atmosphere in a careful lighting. Newly fitted kitchen with pink and grey marble counter incorporating dishwasher, electrical oven and all modern appliances. This villa is ideal for those seeking to combine the attractions of Italian Riviera with the space, seclusion and comfort of an independent villa and garden. The villa boasts a fantastic green landscape along the vertical axis parallel to the garden 3 kms far from sandy beaches. The perfumes of the plants surrounding the villa mix with sea breeze. You can begin to breathe and fill your eyes with blue and sky, enchanted by the beauty of Mediterranean vegetation with pink and yellow flower cushions shaped. A scenographic large staircase in marble joins the terrace with luxuriant gazoned garden with plenty of exotic plants including Pink Pepper Tree, Pink Tamerix coming from Northern Africa Coast, many kinds of Palms coming from South America and a small evergreen tree of kumquats (Chinese tangerines). Everything in the garden looks like to be placed in an amphitheatre to admire the spectacular seaview on San Remo bay. A particular contrast between white walls and and warm colour of a valued Douglas wood of bedroom doors is effective. In this villa edrooms are in perfect harmony with the surrounding natural landscape . The three bedrooms (each one with a queen size bed) have a flower’s name: Red rose, yellow rose and daisy. A beautiful brass bed on a warm honey wooden floor welcomes you . On the ceiling a big chandelier with crystal lozenges. Furniture is very comfortable. It’s the bedroom with so many colours (oriental arabesques on the curtains, fantasy coverlets, natural wood). From this bedroom the glance gazes at the garden and the sea allowing you endless aesthetic perceptions. Overnice mosaic floorings with marble ornaments feature this wide bathroom made by sea colour. A shower with a light blue brick wall offers a refined and creative design. The moss colour is all around this bathroom with tub and hand shower. Furniture has been created to offer an innovative ambiance of relax and well-being. We can help you to solve any doubts or simply we will describe you the villa and beautiful surroundings. claravim@yahoo.com We will contact you!!! Emeraldine bathroom shows light tiles, a large wall mirror and Carrara marbles. Blue sea bathroom shows blue tiles inspired to the sea, a nice coloured glass shower, a large wall mirror and Carrara marbles. A large master bedroom with a comfortable queen size bed, two mirrors wardrobe, a nice drawer has an ensuite new tiled marble bathroom with tub. The two other bedrooms have wooden floor and are close to a fine bathroom with a coloured glass brick shower and Carrara marbles. A perfect accommodation for people searching for a high standing quality and a complete privacy. Our guests have the unique opportunity to sunbathe or make al fresco candlelit dinners on the large terrace bordered of white balustrade with a majestic marble stair leading to the Mediterranean garden. This garden is planted with specimen shrubs and flowers that are planned to give beauty throughout the year. In a short walk you can reach the bus stop where you can catch a bus to go downtown or in a 5 minutes you can sit at one of the best fish restaurants on Italian Riviera called 'Ulisse'. 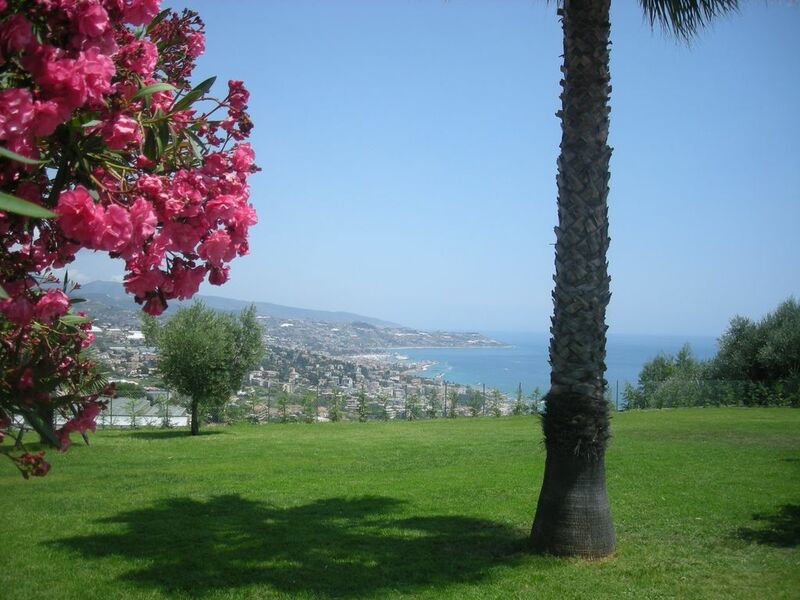 The villa is situated about 3km from the centre of San Remo high on the hillside overlooking the town. There are other villas around it but there it is still very private and enjoys great views. The decor and facilities in the villa are adequate. Clara was very helpful and gave us plenty of information when we arrived. The property was spacious felt like we were in our retreat. Very private. We were eight people and room for all. Clara was very helpful and answered all our needs. She was a delight. I would recommend this very highly. The beaches were great we were in a off season not crowed . Loved exploring all the little towns and stopping for expresslo and Gelato. Yeswewill be back. Clara was a very kind host. Her house is very nice and has a beatyful big garden with a stupendous view on san remo, the coast and mountains. Its like sitting in a garden cinema. The villa itself is also nice and clean. Very quiet area, nearly no traffic noises. Good choice for a pleasant stay even with a lot of kids or dogs. There is enough space. We will definitely come back. ?????????? ??? ? ???????????? ????? ?? ??????? ?? ????? ??? ????????? ?????????????? ??????? ?????. ??? ?????? ???????? ???? ? ???????????? ??? ??? ???????????? ? ????? ?? ??????? ?????. ??? ???? ????? ???????. ??????? ?????! ???????????? ?? ?????? ? ?????? ??? ????? ????? ??????, ? ?? ??? ???? ??? ??????????? ??? ??? ?, ??? ?? ?????? ? ? ????????? ???????? ?????. ??????? ?????? ??? ??? ???? ?? ???????????? ????????????. ?????????? ???????? ?, ?? ????????? ??????????? ???? ? ???????. ??? ?????? ??????????, ? ??? ?? ???? ?????? ??????????. ?? ??????? ??? ??????????? ?, ?? ??? ????? ?, ???????? ??????????? ??? ?? ?????. ????? ???????? ????????? ?, ???? ???????? ?? ??????? ???????? ? ??????? ????? ????????????? ??? ??? ???????. ? ????? ??????????? ?? ???? ???? ???????? ???????????. ?? ???? ???? ??????????? ???? ???? ??. ???? ?? ??? ?????? ?????????? ? ?????? ???? ?????? ?? ??? ?, ?? ?????????? ????? ??????. ?? ???? ??????? ??????. ? ?????? ? ???? ?? ??????????? ? ????? ?????????. ?? ???? ????????? ??? ????? ?????????! ??? ????????? ?, ??? ????? ? ?????. ??? ????? ???????????! Upon arrival at the villa we were met by a charming hostess Clara . Was covered with a great dinner and cooked for us guides and maps in Russian. It was very nice. Thank you Clara ! Looking around, we came to the conclusion that the villa is very good, and it has everything you need for what would be good and a comfortable stay. A big plus for us was its isolated location. Residing in solitude, do not bother strangers and views. The house is well equipped and of itself is very pretty. But its main advantage, in my opinion, is a stunning view of the city. The villa is quite spacious, our company of four adults and four children settled there with no problems. In walking distance from the house there is a nice restaurant . In all this splendor is one thing. If you want to settle down there and every day to go to the sea , it is advisable to have a car. To the sea really far away. And the road to the sea is not conducive to pedestrian walks. Throughout the rest of this place is perfect ! House fresh, everything is clean and cozy. We loved it! it has been wonderful to meet you and your family . I know that it is a long journey from Russia and I love to welcome Russian guests (with a bit of my Russian Language) to introduce San Remo, Italian food and wines, local restaurants and itineraries . Your kids are so nice and I am sure that they have enjoyed the large garden. There is a lovely restaurant through the back gate of the villa , a 5 minute walk , Ulyisse, if you do not want to drive into town . The summer weather is guaranteed so do not bother packing any long sleeved shirts. Clara runs the villa very well and we had no problems with return of deposit etc. She was full of sensible advice and easily contactable. Downsides?... Well some may feel the need for WiFi which the villa did not have . i can think of little else to criticise. Look at this villa if you want a short flight to Nice from almost anywhere in Europe and an easy drive to Sanremo. the views from the villa of the sea and Sanremo are spectacular and it is free of traffic noise. Thanks a lot for your positive comments. We are confident to welcome you again in the next future. Following to your suggestions we are pleased to tell you that we have put the line WI FI so everyone who will come furtheron will have the opportunity to connect its computer . "Prachtige woning en locatie, zeer grote tuin met schitterend uitzicht. Eigenaar erg vriendelijk en zeer behulpzaam. Zelfs midden in de nacht toen we onze sleutels kwijt waren kwam ze om de reservesleutels te brengen. Barbeque was eerst niet aanwezig maar werd nog dezelfde dag een nieuwe bezorgd. Zeer aanbevolen als je van rust, ruimte en privacy houdt. Beautiful villa and location, very large garden with stunning view. Owner very friendly and helpful. Even in the middle of the night when we lost our keys she came to bring the spare keys. At first barbeque was not there but the same day a new one was delivered. Highly recommended if you like to quiet down, space and privacy." .In May,June, July, August and September weekly rentals from Saturday to Saturday only.